German pianist, Joseph Moog, has received numerous awards for his recordings and he was Gramophone’s Young Artist of the Year in 2015. His primary focus to date appears to be the Romantic piano repertoire although he has recorded a collection of Scarlatti sonatas and his recent recitals feature works by the Classical composers as well as by Debussy and Ravel. For his contribution to the centenary of Debussy’s death, he has paired that composer’s highly virtuosic Études with Ravel’s equally virtuosic Gaspard de la Nuit. Chopin provided the model and inspiration for Debussy’s Études although they also incorporate some of the unbridled virtuosity of Liszt. Debussy wrote these works in the summer of 1915 when he was suffering from cancer. He was fearful that he might not live to complete the work and in October 2015 he wrote: “I write like a madman or like one who is condemned to die the next morning”. Joseph Moog has a big technique and is certainly on top of the daunting technical difficulties in the Études. As with Chopin’s Études, the musical demands are just as important as the technical ones. Moog is alive to this and provides us with a highly cultivated and musical performance which transforms each of these short, demanding works into poetic tone poems. ‘Pour les cinq doigts’ opens unobtrusively like a childlike Czerny study but, as the music builds in complexity, Moog produces a wide range of increasingly rich and vibrant sonorities. ‘Pour les quatres’ opens in a luminous, spacious way and this is followed up with imaginative contrasting rhythmic figurations. Moog provides us with radiant tone painting in ‘Pour les sixtes’ and a virile muscularity in ‘Pour les octaves’. The finger-work in ‘Pour les huit doigts’ is dazzling and it is impressive to hear this étude played with such unbridled virtuosity. I was less convinced by ‘Pour les agréments’ where Moog perhaps could have luxuriated a little more in Debussy’s perfumed fragrances. ‘Pour les arpèges composés’ is often played as a solo piece in the concert hall and is the most famous piece in the set. Moog summons an exquisite web of rippling, beautifully shaped arpeggios from his Steinway before bringing the piece to a cultivated conclusion. ‘Pour les accords’ shows Debussy at his most Bartókian and Moog brings rhythmic punch and vigour to the chordal leaps which open and close the piece. Moog also performs a further étude which was discovered and realised by Debussy scholar Roy Howat in 1977. The work is headed ‘Pour les arpèges composes’ but it contains very different material to the eleventh piece in Debussy’s final set which has an identical heading. Moog gives an enchanting performance of this beautiful piece. Ravel’s Gaspard de la Nuit was written in 1908 some seven years before the Debussy Études. The three movements are based on the macabre poems of Aloysius Bertrand and it is one of the most technically demanding works in the standard piano repertoire. I had rather mixed feelings about Joseph Moog’s performance. The right-hand shimmers which open Ondine are a little bit loud and the melody consequently does not have the dangerous, seductive allure which one hears in other performances of the work. Moog navigates his way through the central section well and succeeds in bringing the work to a powerful climax. The final section depicting the mocking laughter of the water nymph bursts forth in an explosive way and is very good indeed. “Le Gibet” is well controlled technically and Moog and brings a remorseless rhythmic insistence to the work. However, this performance lacks atmosphere and does not effectively depict the grizzly scene in Bertrand’s poem. “Scarbo” is the most successful of the three movements and Moog’s performance is one of the fastest I have heard. The passagework is admirably clear and Moog’s Lisztian bravura unleashes the eponymous shape-shifting goblin in a thrilling way. 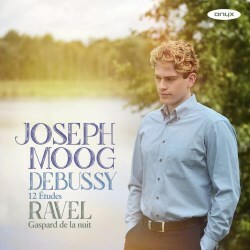 Moog’s performance of the Debussy Études is first-rate and compares well with other recordings. However, he is unable to match Uchida or Bavouzet who both bring a wider range of textures and a greater sensitivity to Debussy’s shifting sonorities. Moog’s performance of “Scarbo” is impressive but I was less convinced by the other two movements of Gaspard. Michelangeli, Argerich and Pogorelich are all better at conjuring atmosphere and tone painting, and they all provide much more compelling accounts.